Surf Ave. & West 8th St.
Take the F or Q train to the West 8th Street station in Coney Island, Brooklyn. Alternatively, take the N or D trains to the Coney Island-Stillwell Avenue Station, then walk two blocks east on Surf Ave.
Take the B36 to Surf Ave. and West 8th St. Or take the B68 to Neptune Ave. and West 8th St., then walk south along West 8th to Surf Ave. Please note that other bus routes in Brooklyn, as well as buses from other boroughs, intersect with B36 and B68. Using a GPS unit to navigate to the Aquarium? To reach our parking lot, please plug the following address into your GPS unit: 602 Surf Ave. Brooklyn, NY 11224. Take the Brooklyn Battery Tunnel (I-478) to the Brooklyn-Queens Expwy (I-278 West). Take Exit 22 to the Belt Pkwy East. Take to Exit 7 (Ocean Pkwy). Turn right onto Ocean Pkwy and continue to Surf Ave. to the New York Aquarium. Take the Belt Pkwy West to Exit 7B (Ocean Pkwy). Turn left onto Ocean Pkwy and continue to Surf Ave. to the New York Aquarium. Take the Hutchinson River Pkwy (I-678) South, over Bronx-Whitestone Bridge, and continue south on I-678 (Whitestone Pkwy) to Van Wyck Expwy. Then take Belt Pkwy West to Exit 7B (Ocean Pkwy). Turn left onto Ocean Pkwy. and continue to Surf Ave. to the New York Aquarium. Take the Staten Island Expwy (I-278) East across the Verrazano Narrows Bridge, to Belt Pkwy East to Exit 7S (Ocean Pkwy South). Take Ocean Pkwy to Surf Ave. to the New York Aquarium. Take the New Jersey Turnpike to the Goethals Bridge (Exit 13) to the Staten Island Expwy (I-278). Follow the directions from Staten Island (above). The New York aquarium is housed on 14 acres and packed with tons of ocean life. Besides viewing over 300 marine species, you can touch sea stars or watch the sea lion shows. The New York Aquarium is open 365 days a year. Last entry into the Aquarium is 1 hour prior to closing. 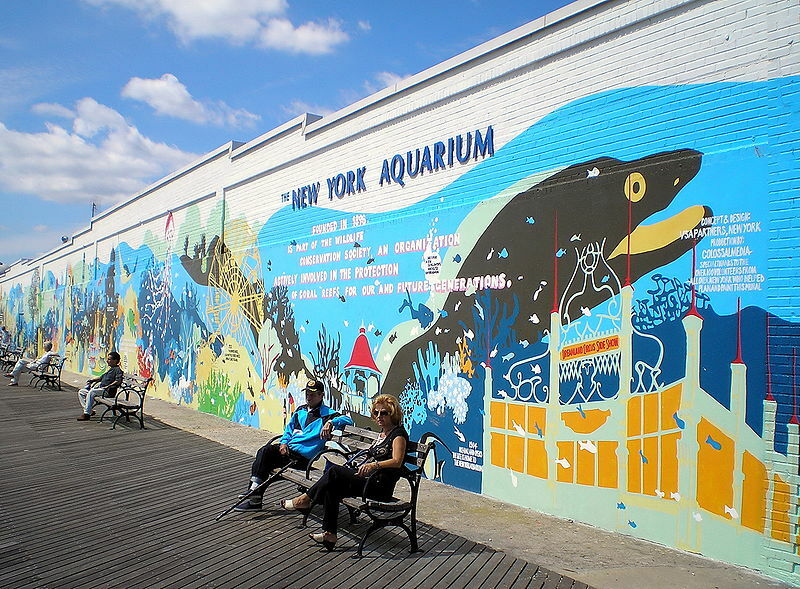 Learn more about the transformation the New York Aquarium is undergoing. The New York Aquarium was hit hard by Superstorm Sandy. They are in the process of rebuilding some exhibits and making the aquarium better, so some parts of the aquarium may be closed at times, but there is still a whole lot to see!